Stamp it, Scrap it, Share it: Cocoa Loves Football! This is Cocoa Loves Football and so do my boys! I paired it with Sport Sentiments, although the circle sentiment is not a Sweet n Sassy image, but it worked well. I kept this card very simple which makes it friendly for our toddler friends. 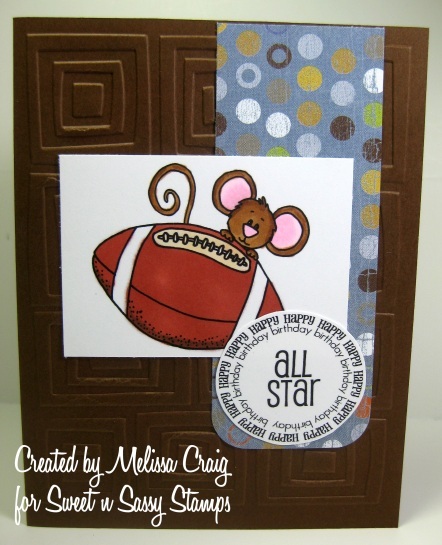 I also used a great sketch from Paper Craft Planet to create this card (sk122510) for the layout. Don't forget that all Christmas stamps are on sale until January 1st - 30% off!! And then on January 1st Korin will be releasing some wonderful new stamps... I cannot wait to show them to you. Thank you for visiting my blog - I love hearing from you!